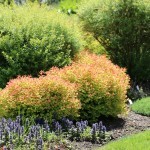 A compact, mounding shrub with pink flowers throughout the summer. The blooms are attractive to butterflies. 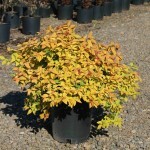 The foliage is bronzy-gold when new, yellow-green when mature and coppery-orange in the fall. It shows good heat tolerance. It prefers full sun and an average, well-drained soil. Prune in late winter or early spring if needed. 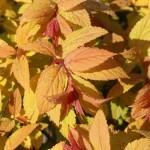 May be used in shrub borders, mass plantings, or as a low informal hedge.